Every love story has twists and turns that make it unique and wonderful. 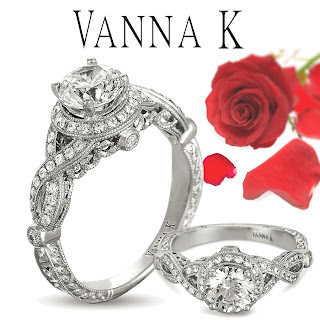 This diamond engagement ring by Vanna K is the same. With each beautiful twist in this intricate design, more light illuminates from each diamond. Every twist comes back together in unity, ultimately leading to the pivotal round center stone; the symbol of true togetherness. Let the story of your separate winding roads end here, this year, with this amazing ring which will unite you two together forever. Find this ring and other unique diamond engagement rings today at Vanna K.